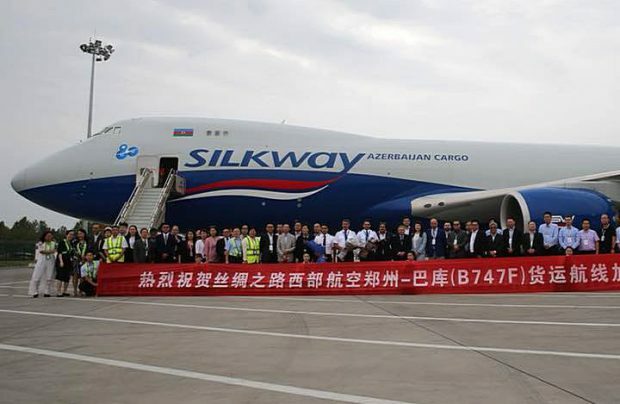 At a new stage in its focus on Chinese destinations, Azerbaijani all-cargo carrier Silk Way West Airlines (SWW) is opening a new route and increasing the number of its freighter flights to China. The Azeri airline is launching a new twice-weekly flight from Baku to the major Chinese city of Tianjin, a route that will connect the airline’s hub in Baku with one of the leading industrial centres in northern China. “With this service we will satisfy a strategic gap in offering full freighter services to the booming northern China marketplace. We have noticed a strong east and westbound demand, with a focus on automotive and aerospace related goods,” reveals Wolfgang Meier, SWW’s president. In another development, Silk Way West is to increase flight frequencies between Baku and Zhengzhou (Henan Province) from four to six weekly frequencies. Silk Way West’s fleet currently consists of 12 Boeing 747 freighters, covering a network of some 45 destinations through Baku, connecting China, Central Asia, Japan, the Middle East, Europe, Africa and North America.